Today severe storms (yellow danger level) with all sort of rays, thunders, hail, etc were announced. Just like yesterday. What a weekend! Actually, yesterday the storms distribution was inequal, and while at Bilbao just some rain drops falled, just 30 km away golf balls sized hail were suffered!. I didn't want to take the risk. Well, now the activation itself. 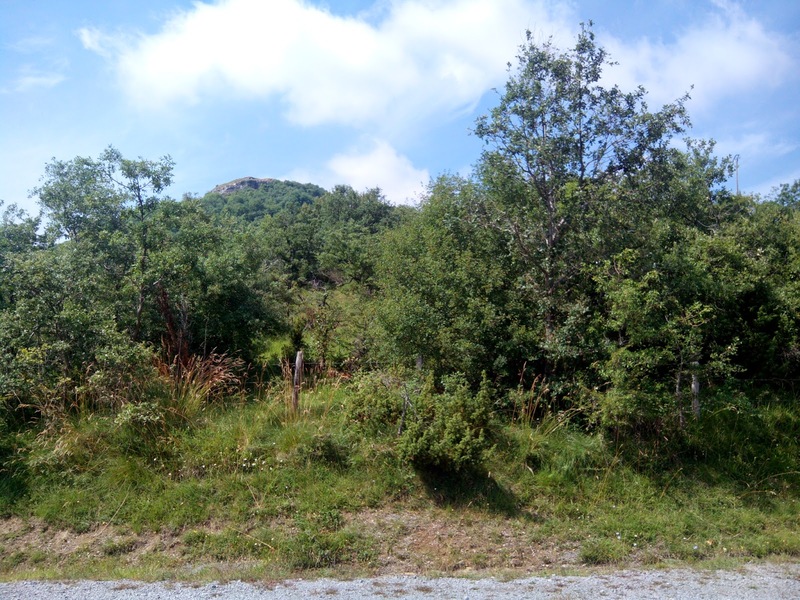 There are a pair of low summits near Vitoria-Gasteiz, our capital city, and close to Ullibarri-Ganboa water reservoir that I've been planning to activate. Urbina EA2/VI-052 and Santa Cruz EA2/VI-051. They can be done on one day, and the plan was to start with the second, Santa Cruz, and depending on the weather, make the first or not. to hike, but too hard for my old bones! 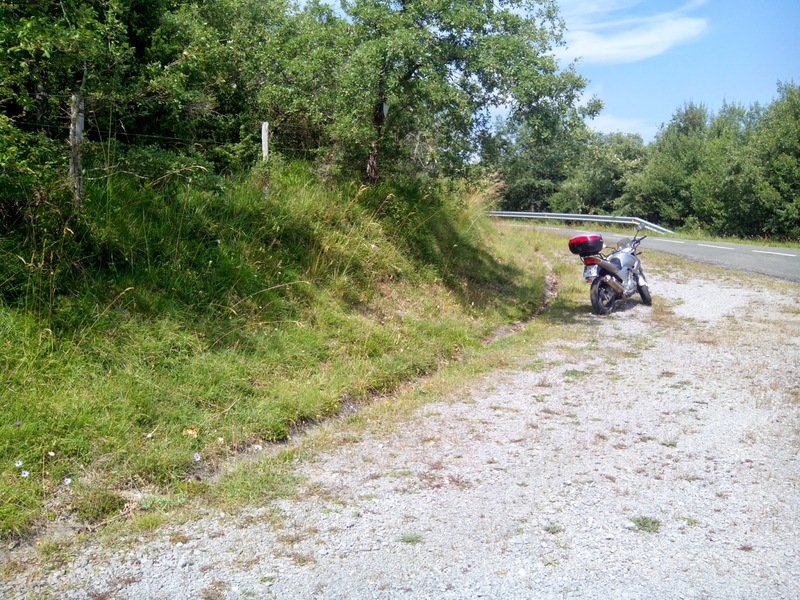 So, I toke my motorbike, and made the 1 hour trip to Araba, about 70 km south of Bilbao. The landscapes of the zone were amazing, later you'll see some of them. The route was along Barazar mountain road, and it was foggy and cold. The expectations were not good at all... But as I was approaching the summit surroundings, the weather turned sunnier and hotter. Good news!. I left the bike beside the road 1 km before the small village of Langara Ganboa. Just in front, I could see the reservoir, with a landscape of mountains, and the little island of Zuhatza. Near is also the "Araba Yatch Club" at Uribarri-Ganboa. A bit odd for a city without coast. After dismounting all the junk from the motorbike (umbrella, pole, rutshack) and leave the helmet, gloves, ropes, etc, and now under a hot sun, I started the hike. It seemed to be short but hard. 15 min of ascending later along a path with sometimes more than 40% of slope, I was at the summit, but thinking I'd lost 5-6 litres of water spreaded around, and thirsty and hot as on the middle of a desert! I've carried -as It was said the weather were going to be stormy and cold- just 1/4 l. of water. Cleary not enough. But, while recovering the breathing, I started to notice the landscape... Marvelous! far, the mountains. Just under the summit the reservoir with the island, small villages... on a pretty sun. I toke my time to enjoy it before setting the equipment. the most beautiful landscapes were at sight. Finally, I started with that. I had the FT-817, antenna norcal doublet (re-made, now it is only ribbon strip, without coaxial between it and the tuner), Elecraft T1 and 8Ah LiFePo4. The SOTA segments on HF were plenty of activity mainly from EU, and I managed to make 70 QSOs and 10 summit-to-summit. Among them, some EA2 fellows as Antonio EC2AG at EA2/BI-036 Arrugaeta and Marcial EA2BDS at EA1/BU-081 Cornejo. 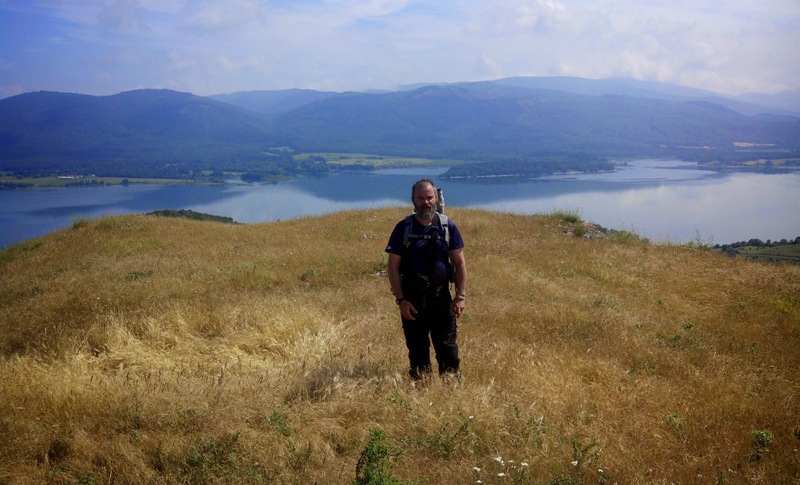 Edited 24/06/2014: I've just find on the SOTA reflector a post of Christian OE5HCE about his activation at Kaiserschild OE/ST-091 and Hochkogel OE/ST-088. In this last one, we made a S2S QSO, and Christian recorder it on video. It can be seen from minute 8:06 just at the end, but better if you watch all the video, as it was an amazing -and pretty risky- activation. The 6m high pole at the geodetic trig point. "My" summit, Santa Cruz has been activated three times before, but never on CW, so I toke special attention to this mode. Unfortunately, I made a mistake. Having planned Mt. Urbina and Santa Cruz EA2/VI-052 and EA2/VI-051, I changed both, and I was giving the reference of Mt Urbina, which has been activated twice recently, also in CW. Well, it's not all bad. Now the chasers must change the wrong reference for the new one, for sure, on CW. As always, I would thank to all chasers for being there! 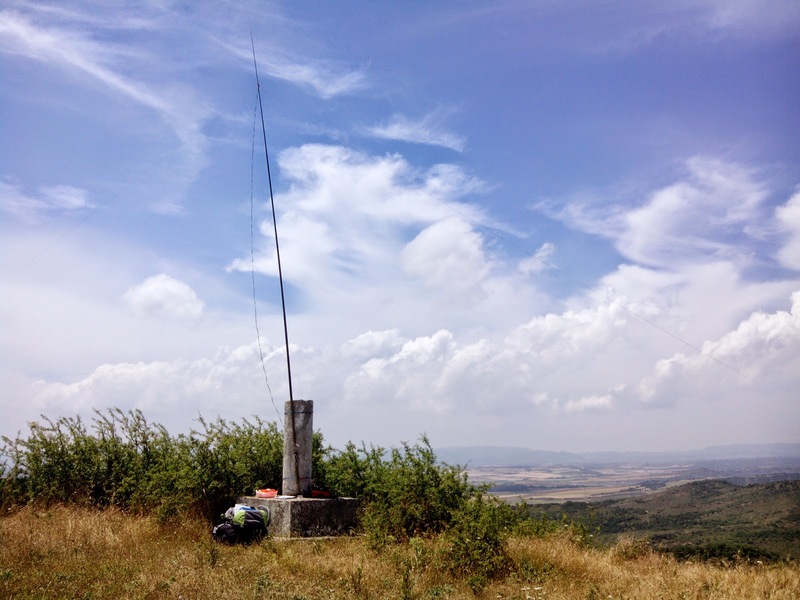 SOTA Trip to EA1: 7-8/6/2014 First VK-EA S2S QSO.